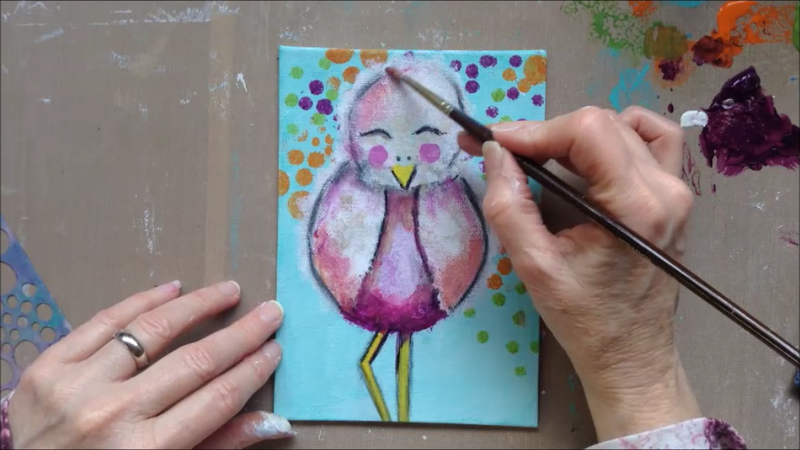 This class is a great start for the beginning artist and will teach the young artist how to use the stippling technique for making a whimsical bird. This class starts with creating our own simple stencil. We will use this stencil in our background and draw a whimsical bird using charcoal and acrylic paint. Our bird will come to life when we use the stippling technique, blend colors on the canvas, and create shadows using charcoal and graphite. In completing our little painting, we will enhance the background by applying gesso and dry brushing acrylic paint for a distressed look. A beginning artist that wants to learn how to use acrylic paints. An established artist who wants to explore applying the stippling technique to build texture and movement. How to use a limited color palette to create a small painting with the cute factor. How to make your own simple stencil and use it to create a whimsical background. How to use the stippling technique to create texture in your painting. How to add shadows and depth using charcoal, graphite, and a blending stump. How to enhance your paintings background by dry brushing a distressed look. Canvas board or watercolor paper.